Vickers has here selected his “ten best” DoDE stories. These are all “inverted” mystery stories; the reader knows from the start the murderer, the motive, the details of each crime. An investigation is made but the files find their way to the Department of Dead Ends, the repository of cases not solved, clues which led nowhere. Then eventually, sometimes many years later, some small fact or occurrence comes to the attention of Inspector Rason who finds a connection and solves the case. I got this paperback second hand some years back and let it sit on the shelf for some time before picking it up to read. That was foolish. Once started I couldn’t put it down. These stories are terrific! This entry was posted in Books & Reading, Friday Forgotten Books, Non-fiction. Bookmark the permalink. This sounds great, Rick. I will have to find a copy. I remember liking this a lot but it was ages ago so I must pull my copy out again (mine is also a green penguin as I recall). Great choice! Good choice, Richard. 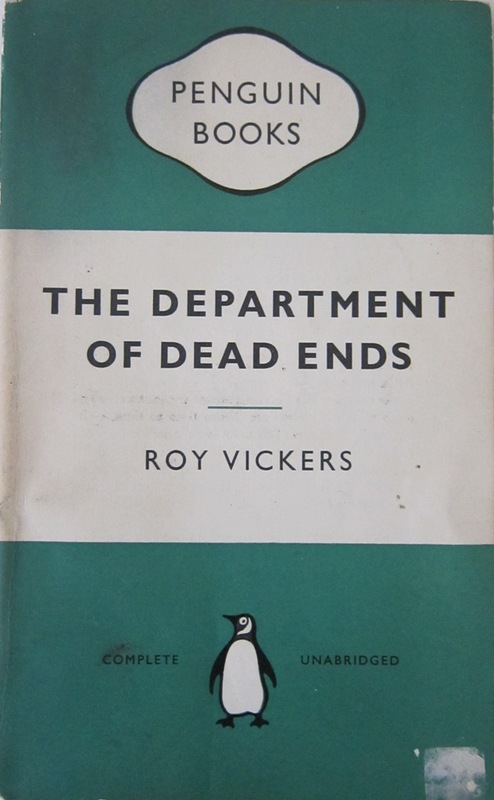 The Department of Dead ends stories were a favorite of mine since I first encountered them in old EQMMs. If memory serves, there were three different versions of this book, each with varying contents: the one you read, a collection edited by Ellery Queen, and one from the Detective Book Club. I read these DEPARTMENT OF DEAD ENDS stories decades ago. DOVER BOOKS reprinted it back in the 1980s. Classic mystery stories! Didn’t know that, I’ll have to hunt it out. Good choice. I read this one years ago (though without access to my database I can’t be sure which edition I read) and enjoyed it. I don’t think I’ve read any Vickers novels but I’ve read a lot of his stories. Richard, I used to try and collect these Penguin editions but gave up after a while. We don’t get them easily in my neck of the woods. And what a great book title, Richard. I will look for a copy. Definitely. That sounds interesting. And I do love those old penguin covers. You’ll like the stories, too. Vickers has a wonderful author voice. Must hunt this one down!